A call to Alex Lees-Buckley at Camper & Nicholsons brings news of a hefty €2.995 million price reduction on his joint listing with Gaston Lees-Buckley, the 56m sailing yacht Selene. Built by Perini Navi in 2007 and boasting a Ron Holland design, her sleek lines and overhanging flying bridge are hallmarks of their aesthetic style. Her aluminum construction assures speed with uncompromised comfort. Selene features a very elegant innovation in her transom, which hydraulically opens and reveals a structural staircase ending with a wide swimming platform for guest access to the sea. Her modern art deco-inspired interior won the best sailing yacht interior award at the World Superyacht Awards 2008 and she also featured in the 2008 edition of The Superyachts book. 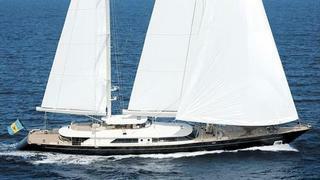 Selene is now asking €25 million.